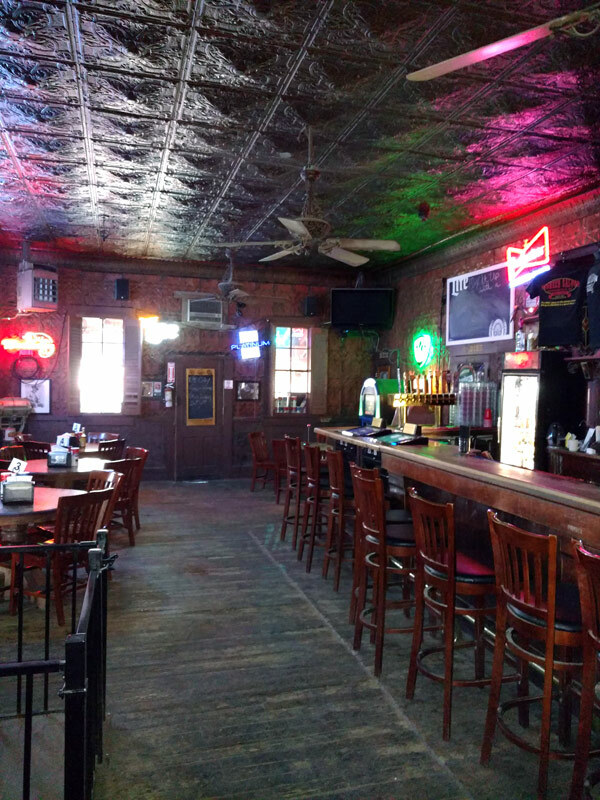 Oddly enough this story begins with a trip to the Pioneer Saloon in Goodsprings, Nevada. I had heard that Clark Gable was at this saloon in the early 40's and never knew exactly why. 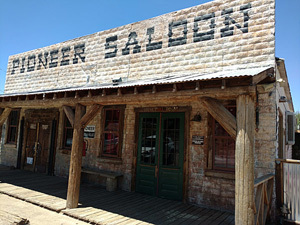 The Pioneer Saloon was built in 1913 and has been featured in several TV shows and movies. Since this saloon is only a short drive south of Las Vegas and has a colorful history I had to go visit it! When you first drive into Goodsprings it is as if you are traveling back in time. The town is almost like a "ghost town" and it is said that the population here is around 229. The bar itself is over 100 years old and is the first building that you notice when you drive into town. 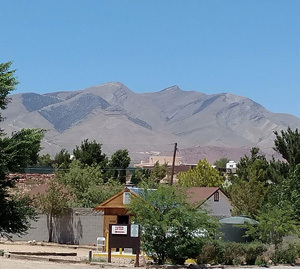 Over the years, lead, silver, copper, zinc, and gold have all been mined from this area but during World War I and World War II the town really "boomed" due to the need for metals and ores used in the war effort. Of course this still doesn't explain why Clark Gable was here but there is a connection between Gable, the Pioneer Saloon, and the crash of TWA flight 3. In 1942 TWA (Transcontinental and Western Air) Flight 3 was a scheduled transcontinental domestic passenger flight from New York City, to Burbank, California, with stops in: Newark, Pittsburgh, Columbus, Dayton, Indianapolis, St Louis, Kansas City, Wichita, Amarillo, Albuquerque, and then direct to Los Angeles/Burbank. 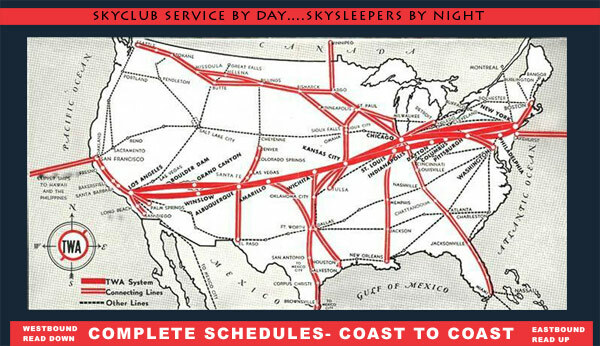 TWA called this route "Sky Apache" the total distance for the trip was 2,625 miles and took over 15 hours flying time (in the air) to complete. TWA operated the route with Douglas twin-engined DC-3-382's like that seen here on the ramp in Boulder City, Nevada. The Douglas DC-3 was powered by two, nine cylinder Wright R-1820 G202A Cyclone engines rated at 1200 H.P. each giving the airplane a cruise speed of 207 mph and a range of 1500 miles. 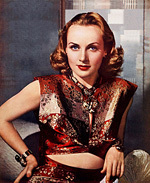 On the morning of January 16, 1942 actress Carole Lombard (wife of Clark Gable), Elizabeth Peters (mother of Lombard), and MGM press agent Otto Winkler boarded TWA Flight 3 in Indianapolis, Indiana to return to California. Lombard was returning from a successful War Bonds promotion tour in the Midwest, where she helped raise over $2,000,000 (which would be worth $31,152,516.13 today)! At the scheduled stop in Albuquerque, New Mexico TWA Flight 3 took on an additional 15 U.S. Army Air Corp members and made a crew change. At this time during World War II military personnel were deemed essential and took precedence over other passengers so Lombard, Peters, and Winkler were asked to deplane in order to accommodate them. 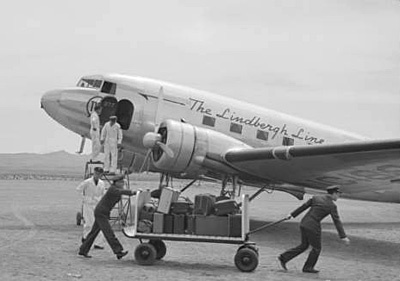 Lombard "made a fuss" and insisted that her party was essential to the war effort and convinced the station agent to let her group reboard the flight to continue on and as a result of this three other passengers were removed from the flight. This would turn out to be a fatal "twist of fate" for Lombard and her party later on in the flight. According to the Civil Aeronautics Board investigation report, TWA Flight 3 is regularly scheduled to operate between Albuquerque, New Mexico, and Burbank, California, without any intermediate stops. It was planned, however, that this flight should make intermediate stops at Winslow, Arizona, and Las Vegas, Nevada, because of reduced fuel to accommodate the passenger and cargo loading from Albuquerque. After the Captain of TWA Flight 3 reached cruising altitude and had an opportunity to establish ground speed and fuel consumption, he apparently found that he could continue to Las Vegas, and still have a sufficient supply of reserve fuel remaining in the tanks, thus eliminating the necessity of an extra landing at Winslow and consequently save time. Las Vegas Army Airfield (now Nellis Air Force Base) was chosen over Boulder City, Nevada (the logical choice because it had a TWA terminal) as a fuel stop because in 1942 Boulder did not have runway lights. Landings and Take-offs at night from this airport were Not Allowed. This could quite possibly be the ultimate/fatal mistake made for TWA Flight 3. According to the Civil Aeronautics Board investigation report, TWA Flight 3's flight plan was usually prepared by the First Officer under the supervision of the Captain, and was to be approved and signed by the Captain (in this case was never signed by the Captain) indicating a magnetic heading of 218° which is correct if departing from Boulder City, NV to Burbank, CA but is incorrect if departing from Las Vegas Army Airport to Burbank. (The heading should have been 205° to take them to Burbank, CA.) In addition, the highest obstacle when flying the correct course from Boulder City to Burbank is 5800 feet but from Las Vegas to Burbank is 8500 feet (Mt. Potosi) but the altitude filed on the flight plan was for 8000 feet. The correct course is indicated in green on this current sectional map and the actual (incorrect) course flown by TWA Flight 3 is shown by the purple line, the line also happens to be a magnetic heading of 218°. 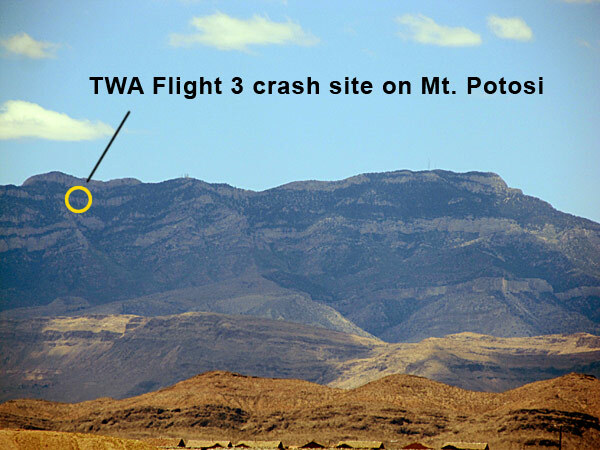 Sadly, on January 16, 1942 at 7:20 p.m. (PST) TWA Flight 3 impacted a near verticle cliff "Double Up Peak" on Mt. Potosi at an altitude of 7,770 feet above sea-level approximately 15 minutes after take-off from the Las Vegas Army Airfield. It would appear probable, therefore, that the airplane had been climbing steadily from the time of take-off, and had not quite reached its intended operating altitude at the time of the accident. All souls on board were lost, there were no survivors. 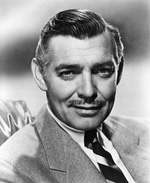 So now the story comes back around to why Clark Gable was at the Pioneer Saloon in 1942. 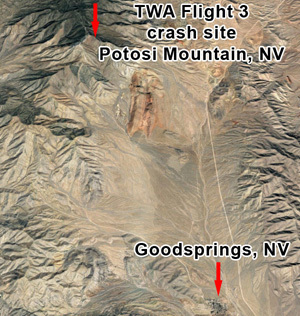 As you can see from the aerial view and the picture I took near the Pioneer Saloon in Goodsprings, NV it is the closest spot from which a search could be mounted to find any survivors of TWA Flight 3. He waited for three days at the bar for word about his wife of less than two years Carole Lombard unfortunately there were no survivors.